Ever since the Clean Cleanse, I've been making a more conscious decision to avoid simple carbs. Brunch is one of the meals where I feel like is hard to eat clean unless you're eating oatmeal or drinking smoothies every morning. Determined to find some fun alternatives, I browsed though some health blogs and found some great gluten free pancake recipes that didn't use any flour at all - only eggs and banana! Sounds too good to be true right? I thought so too. But, I was so excited by the many success stories that I knew I had to give it a try. Unfortunately, I'm sad to say that I failed miserably. The egg and banana "pancakes" were just floppy and looked more like a gross banana omelet than it did a pancake. No way was I going to convince J (or myself) that these would substitute for the real thing. 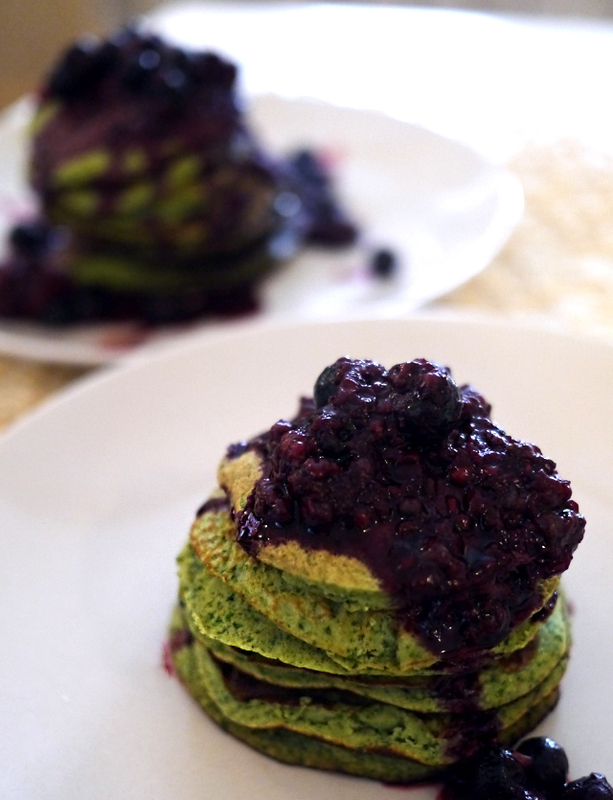 I thought I would give up on the idea of healthier pancakes forever until one day, my friend Jen asked me if I wanted to make her speciality,"Green Pancakes" together. She promised healthy pancakes and so of course I had to say yes. 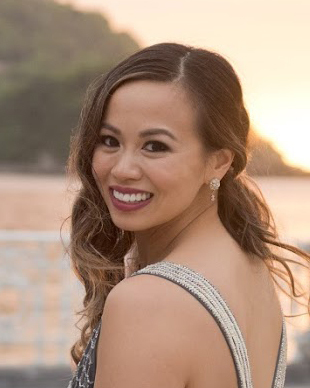 Like most the recipes I have found, Jen's recipe begins with banana and eggs, but hers included a little bit of coconut flour in it - and boy, what a difference that 2 tablespoons of coconut flour makes! 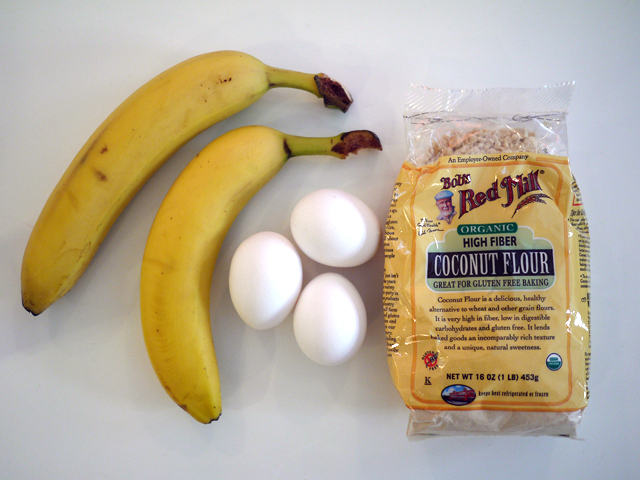 I've always seen coconut flour in paleo recipes, so it was cool to see it in action. To make the pancakes "green", Jen likes to throw in some spinach for some added nutrients. From all my smoothie making, we know that blended spinach never adds much flavor, but is a great way to eat more greens. We also ended adding a scoop of protein powder to the batter, cause, why not? As a healthy substitute for syrup, Jen cooked down some frozen fruit for a mixed berry compote. Just fruit boiled down in a pot, no added sugar or anything. Jen is a woman after my clean-eating heart. It was clear from the moment our green batter hit the pan that these pancakes were going to be a million times better than the floppy mess I made just a few weeks prior. 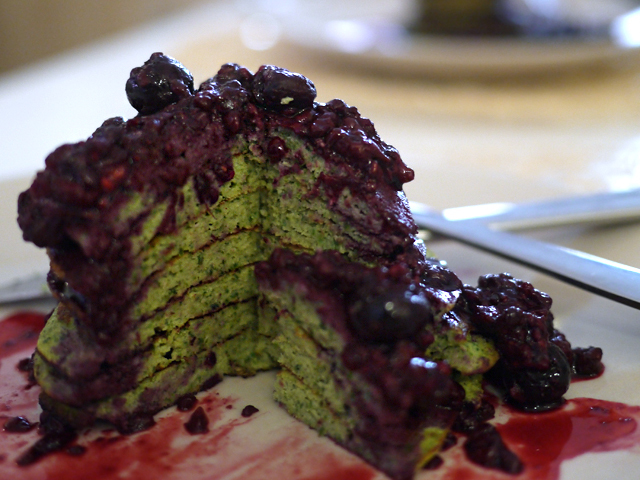 I also loved how vibrant the spinach made the pancakes look. The best part about making these pancakes is to make them tiny so you can make a huge stack out of them. Cutting through so many layers of pancake definitely gave me a lot of satisfaction. Plus they are just so cute to eat! 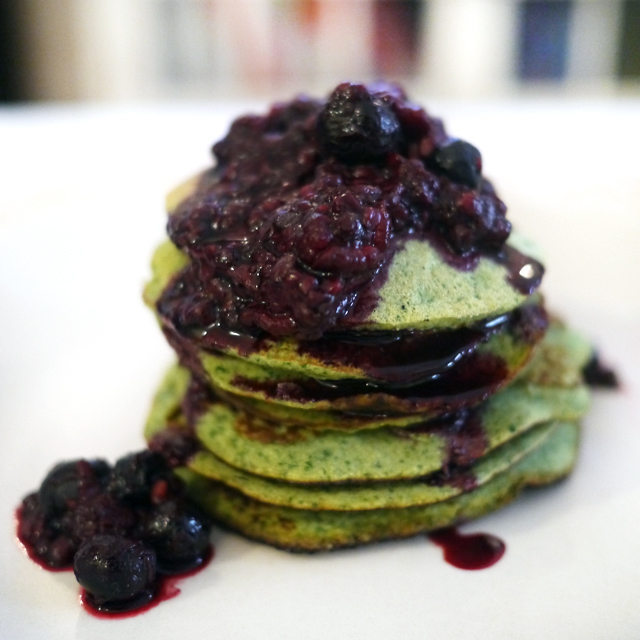 I was so happy with the results of these green pancakes by Jen that I know I'll have to make different variations of it in the future. I happily nom-ed on my pancake stack, and the best of all, when I finished eating, my stomach was happy and didn't feel gross and heavy like it does usually when I eat pancakes. 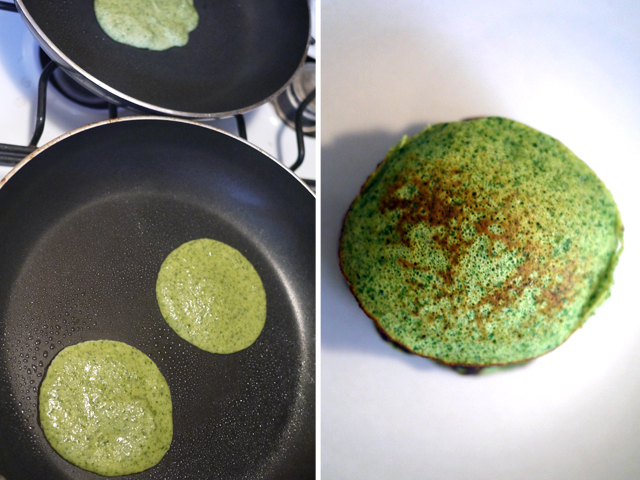 Loving these clean gluten-free spinach pancakes, thanks Jen for the recipe! 1. Make batter. Start off with 2 bananas, 2 eggs and 1 egg white. Add to food processor and blend. Once it's well mixed, add spinach, coconut flour, protein powder and splash of vanilla and blend quickly. Finally add the baking soda and give it a last pulse. Make sure you don't overblend this, blend enough to mix and that's it! 2. Mixed Berries on the side. 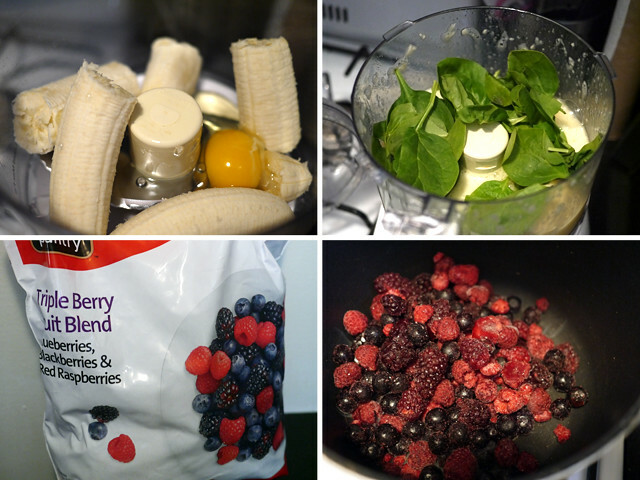 In a small saucepan, add 1 cup of frozen mixed berries and cook over medium heat. The frozen fruit should cook down in about 10-15 minutes, keep a close eye on it to make sure it doesn't burn. 3. Cook pancakes. In a large pan on medium heat, spray cooking spray or use coconut oil to grease up pan. Add batter, cook for about 2-3 minutes and flip. Cook for about another minute, plate and serve with mixed berry compote!